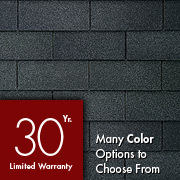 "The top-of-the-line in traditional "3-tab" shingles, Marquis®WeatherMax®is designed for the discriminating homeowner who demands outstanding performance, classic detailing, and a traditional appeal." "Royal Sovereign®shingles combine a simple, timeless beauty with GAF-Elk’s well-known quality — making it the most-preferred fiberglass strip shingle in its class among contractors and builders." 1 See ltd. warranty for complete coverage and restrictions.